SAN NARCISO, Calif. (Bennington Vale Evening Transcript) -- In an apparent propaganda blunder Tuesday, which attempted to depict North Korean leader Kim Jong-un as a champion of his people by dedicating a new hospital, international watchdog organizations found evidence of cannibalism at the top of the country's social and economic food chain. What had always been suspected became reality today -- the North Korean elite eat their poorest citizens. State media agency KCNA released the publicity photo of Kim Jong-un visiting the Taesongsan General Hospital, being constructed by the national army, as a goodwill message. But by showing a staff of chefs instead of surgeons, the grotesque horrors visited upon the North Korean people by their leaders were revealed to the world on film. North Korea, with the continued build up of its nuclear arsenal and its bellicose overtures, has become increasingly erratic over the last week, exposing the fragile and arcane inner workings of its new leadership with the same level of transparency the world is witnessing inside the walls of the Vatican with the selection of Pope Benedict's successor. But where past threats have been discounted, intelligence officials now warn that the rogue nation poses a serious risk to its East Asian neighbors and the United States. During the annual accounting of worldwide threats this Tuesday, the director of National Intelligence cited North Korea as one of the gravest concerns weighing on global security efforts and foreign policy. Just days ago, Pyongyang upped the ante by breaking the 1953 armistice that ended the Korean War and has maintained a tenuous peace on the Korean peninsula. Still, international experts remain ever cautious about aggressive action toward North Korea because of its population, which suffers in poverty, malnourishment and ignorance under the despotic control of the heirs to Kim Il-sung's legacy. The typical North Korean diet consists of tree bark, loose soil and sometimes rice, even though former ruler Kim Jong-il was known to have enjoyed lavish gourmet meals. The long-term consumption of rich meats, dairy products and exotic produce, however, likely ruined Kim Jong-il's system, according to the emaciated doctors who were allowed to autopsy the corpse after his death in December 2011. "It was a sacrifice the Dear Leader made for the people," the attending North Korean physicians said. "To become powerful, we needed all the tree bark and dirt we could get." Members of South Korea's intelligence community found that Kim Jong-il's policy of incrementally eliminating food for his citizens -- a move to help pay for war machines and nuclear weapons -- had yielded unexpected benefits for the world's littlest despot. U.S. State Department spokesman Philip Crowley said at the time: "According to the reports from Seoul, when the North Korean people chew on bark and dirt -- their primary sources of sustenance during the Kim Jong-il regime -- they end up separating the uranium from the soil with their saliva, which accelerated the process of enriching it to weapons-grade. Now, however, they've lost their leader. In all likelihood, they'll revert to eating cooked meats, fish, vegetables and other nutrients that will not yield weapons-grade uranium. That's good news for us." But as the United States and its allies continued to impose tough economic sanctions on the country in response to Kim Jong-un's ongoing saber rattling, the North Korean people were left with even less to eat. The lack of resources also began to affect those in the highest echelons of command. When KCNA posted the picture, some officials attempted to explain that Pyongyang had started training chefs to save money. Obsolete equipment and poor hygienic conditions had created a difficult environment for surgeons, who became increasingly difficult to train. But for North Korean cooks, working in unsanitary conditions and hacking apart meat was seen as a natural fit. 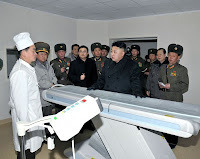 Unfortunately, further probing revealed that the hospital, which adjoins a meat pie shop, is really just a food preparation station for an unthinkable and reprehensible dish Kim Jong-un is calling "thin pig."